Photo: Sappington Farmhouse, Liberty Road, Libertytown, MD. Historic American Buildings Survey [HABS MD-503], E. H. Pickering, photographer, 1936, memory.loc.gov, accessed September, 2012. Frederick County Government offices are located at 12 East Church Street, Frederick MD 21701; phone: 301-600-9000. Frederick County was organized in 1748, named after the Prince of Wales, and has an area of 633 square miles, being the second largest Maryland county. Its topography is agreeably diversified by valley, plain, rolling land and mountain. Many of the early settlers were Germans. The county has always furnished its full quota of soldiers and sailors in wartime, from colonial days to the war with Spain. Francis Scott Key [1779-1843], author of The Star Spangled Banner, was born here, and his remains rest in Mt. Olivet cemetery, in the City of Frederick, beneath the monument erected by the Key Monument Association, and unveiled August 9, 1899. On November 23, 1765, the judges of the Frederick County court repudiated the Stamp Act passed by the British Parliament, and Repudiation Day was made a county holiday in 1894. Agriculture is the leading industry, the soil being fertile and producing large crops of wheat, corn, rye, oats and potatoes. The mountain districts still supply a good quality of oak, chestnut, walnut, hickory and other timber. The railroads are the Baltimore and Ohio, the Western Maryland an electric road runs from Frederick to Mysersville. Iron ore and copper are found in different parts of the county, the most extensive deposits of the former being in the northern section, near Thurmont, where a large smelting plant is located — the Catoctin Furnace, first put in operation in 1774. Near Liberty Town, copper mines are worked on an extensive scale. Frederick City, 61 miles from Baltimore, has a population of 9,296, and is the county seat. 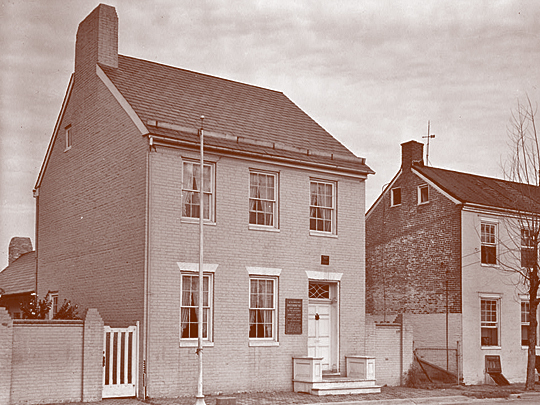 A female seminary, Frederick College, and other important private educational institutions are located there, as is also the Maryland School for the Deaf. Manufactured products of the county include lumber, flour, fiber brushes, fertilizer, furniture, harness, hosiery, crockery-ware, lime, proprietary articles, etc. The county towns include Brunswick, Emmittsburg (near which is Mt. St. Mary's College), Thurmont, Walkersville, Middletown, Buckeystown, Adamstown, Point of Rocks, Creagerstown, Wolfsville, Urbana, Libertytown, New Market, Ijamsville, Sabillasville, Woodsboro, Knoxville, Mt. Pleasant, Jefferson, Graceham, Myersville, Harmony, Johnsville, Ladiesburg, Unionville, Lewistown, Attica Mills and Burkittsville.